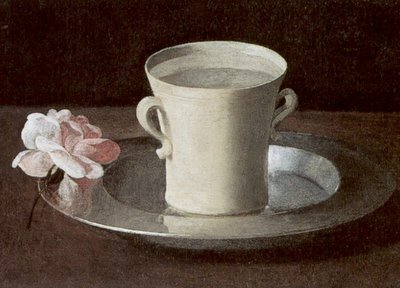 Francisco de Zubarán, Cup of Water and a Rose on a Silver Plate, about 1627-1630. National Gallery, London. I am not officially a teetotaler, but until this week, I had been largely on the leaf (and off the bean) for quite a while. During my recent visit to the capital, I drank as much coffee in three days as I have in the past ten years, and spent my first night more or less velcroed to the ceiling of my hotel room. I am by no means complaining, you understand. I really cherish our quirky regional variations, and I did have some delicious coffee. Riley, Gillian, and National Gallery (Great Britain). A Feast for the Eyes. London and New Haven: National Gallery Publications; Distributed by Yale University Press, 1997. You Can Still Save the World by Drinking Vodka!